ssc results app, ap ssc results android app, SSC AP Results Official Android APP 10th Class Results APP. AP SSC Results March - 2018. Director Genral of Examinations (SSC AP Board) has released an Android app in Google Play Store for viewing SSC Results 2018 through this Android APP. 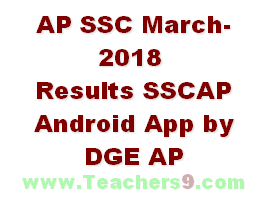 AP SSC Results March - 2018 SSCAP Andriod App to view by DGE Andhra Pradesh Education.